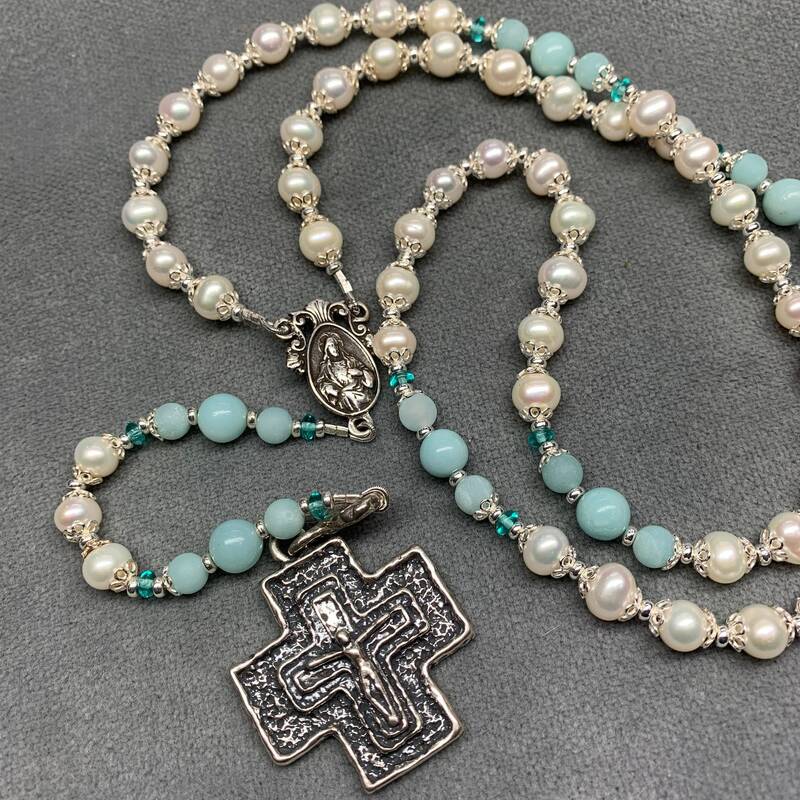 This beautiful and feminine Rosary features AA freshwater pearls, capped in sterling, with lovely Amazonite Paters in a 3-bead design. The larger center bead is polished and shiny, and te 6mm stones flanking it are matte. 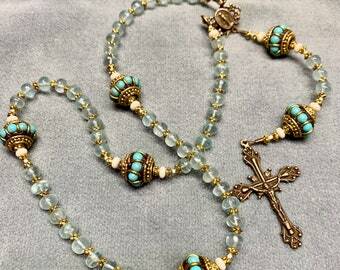 More silver and a small Apatite rondell separate the Paters and the decades for a simple, elegant Rosary. The Sterling center is a double-sided Scapular medal, with Our Lady of Carmel and the Holy Infant on one side and the Sacred Heart on the other. They are superbly rendered. The Crucifix is designed and hand cast in Arizona by a phenomenal artisan. It is substantial and unique -- the Corpus on the Cross was not cast from a mold -- it was created with fire and sterling wire and skill -- lots of skill. With 8mm pearls and a longer Pater, this is a little bigger than the commercial Rosaries. It is especially nice for those with arthritic hands or for men's larger hands, but is not too big or heavy. 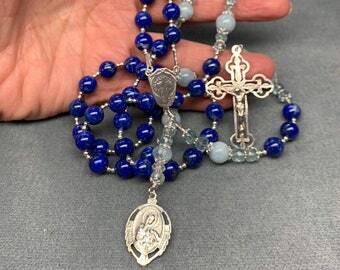 My hands are small, but I find I prefer the 8mm size for my personal Rosaries. The pearls are called 'off round.' meaning the pearls are of a top AA+ rating except they are not perfectly round and consistent throughout the strand. This would be noticeable in a necklace, not so much in a Rosary. 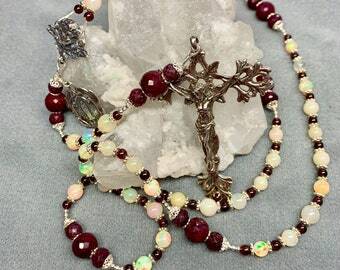 However, surface flaws, depth of nacre and shine/glow are AA+, making it possible to offer a gorgeous pearl Rosary at a price welll below what you would expect. This is a cable Rosary, strung on strong, 49-strand, 40# test wt plastic coated stainless Steel. It is carefully double crimped for durability, and firmly tugged to catch any weakness before it goes out the door. It has a nice 'feel' in the hand, and the cable makes it flexible. Instructions on How to Pray the Rosary are included on sturdy, plastic-covered stock. As always, this Rosary comes boxed and in a delightful beaded organza gift bag--ready for presentation.